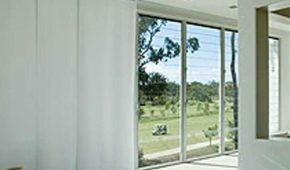 Servicing all areas of Melbourne, Brisbane and the Sunshine Coast, The Blinds Place is a premier provider of panel blinds with a growing selection of premium-quality blinds for home and business owners to select from. Panel glide blinds are highly-versatile and represent the ideal window furnishing solution for large windows, sliding and bi-fold doors, and even as a room divider. Although they’re best suited to contemporary and modern interior environments, panel glide blinds also lend themselves particularly well to many interior environments which are more traditional in style. Offering a uniform appearance that looks the part in both residential and commercial spaces, these attractive, easy-to-maintain window furnishings are quite unique in appearance with their large panels which stack neatly behind each other. This provides an uninterrupted view of the world outside when open and outstanding privacy when closed. When you choose panel glide blinds, not only do you have an exceptional selection of colours to choose from, but you’re also able to select blockout and light filtering materials to further meet the needs of your space. 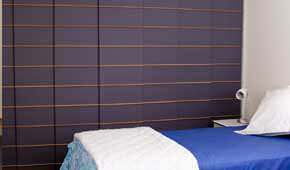 The opportunity to customise these interior blinds to meet your preferences makes panel glides an excellent option. One of the most notable benefits to choosing panel blinds is the ease of operation. Panel glide blinds operate along a simple, unobtrusive track system with an easy-to-use wand that’s cord-free and child-friendly, making these contemporary-style blinds a great choice for family homes. Brisbane, Sunshine Coast and Melbourne property owners can visit us at our showrooms in Maroochydore and Moorabbin, or make the most of our free in-home measure and quote service. To arrange a time for us to visit you at home or work, please call your nearest location or complete our online contact form and we’ll get back to you as soon as we can.